After a very successful edition in 2017, Active Asset Allocation is pleased to announce that the co-founders Adina Grigoriu and Olivier Hiezely will be back in Paris for the 2018 edition of the most exclusive event for the digital finance and Fintech industry : Paris Fintech Forum. January the 30th : our team will have a booth where they will be available to discuss and present the latest features of our digital platform, 1st B2B Robo Advisor in Europe with over 1,3B$ under advisory. 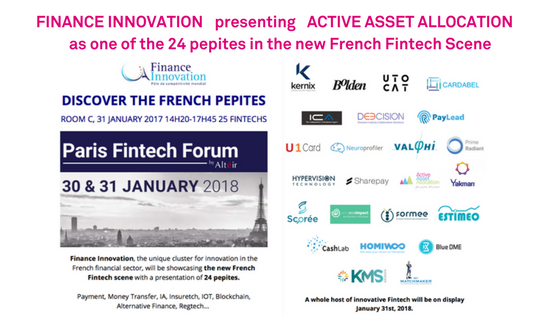 January the 31st :Room C from 14h20 to 17h45 Finance Innovation, the French competitiveness cluster for innovation will be presenting Active Asset Allocation in their showcase of 24 pepites of the French Fintech scene. To be updated in real time with the latest news regarding our participation to this event, follow us on Twitter .